In the United States, the post-sub prime housing crash has meant that consumer spending has stagnated. People are simply not remortgaging their homes to buy boats or other such consumer goods anymore, because there is no longer the expectation that price rises will pay for the boat. This is because prices are slumping due to excess supply built during the peak years. For people who don’t own property in the United States, this price crash has allowed them to get a foot on the property ladder, which is broadly a good thing. Keynesians might argue that the slump in consumer spending is broadly a bad thing, but it’s not: it was never sustainable in the first place. Boosting GDP through unsustainable spending is a short recipe for bubbles. This is because restrictive planning laws during the boom years meant that far fewer houses were constructed. Government, ever since the era of Margaret Thatcher, has pandered to its chief constituency — house owners — by pumping up the money supply, while restricting the housing supply, and creating equity for house-owners. And because wages are still very low in comparison to houses, young people too young to benefit from the house price boom of the last twenty years currently find it very hard to get onto the housing ladder at all. That’s why rental costs have risen to record highs. 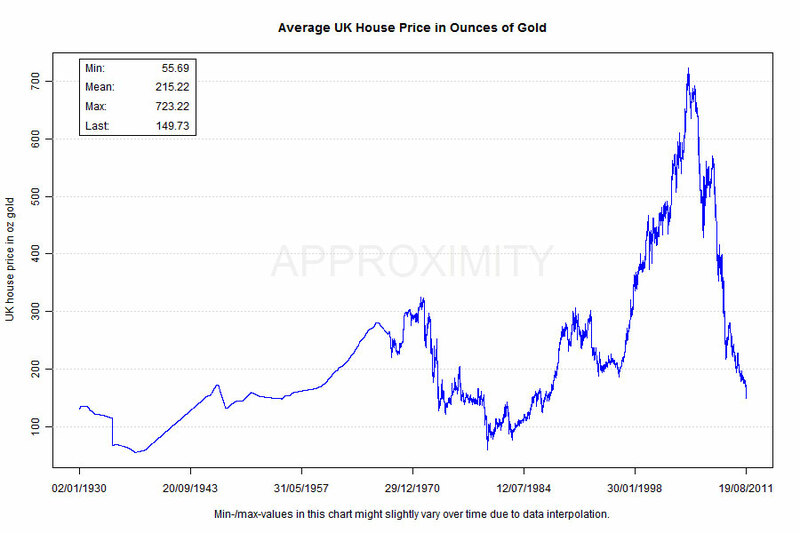 Of course, I expect British house prices to go much lower, both relative to wages, and relative to gold. The current conservative government is relaxing planning laws. This will mean that more houses get built to satisfy demand. That would mean house prices will probably fall priced in wages, priced in gold, and priced in pounds sterling. For those who don’t own property, this is going to be a great chance for them to acquire it. For property owners, this is more bad news. This entry was posted in Current Affairs, Real Estate and tagged bbc news, boomers, david cameron, george osborne, gold, housepricecrash, housing crash, keynesianism, money, priced in gold, real estate bubble, reuters, zero hedge. Bookmark the permalink. I saw something on this flying around the other day. Interesting but isn’t it a circuitous way of saying that our fiat currency has crashed in comparison with gold. The ramifications of the sterling crash for our collective futures bear investigation. 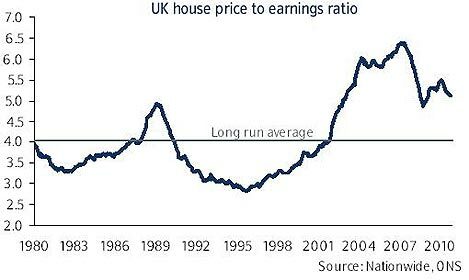 On a separate note, whilst more housing may cause our overpriced house prices to fall, I’m not so sure. 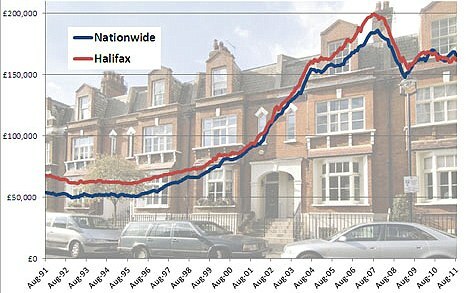 The government necessarily must intervene to hold up house prices (holding back the tide) as once the crash begins middle-class England, deciding they aren’t as rich as they thought they were, will spend less and thus accelerate the second part of the double dip. Actually I’d say that pricing things in fiat is circuitous. The real dynamics of the economy become much more apparent once we remove the fiat intermediary and price houses in ounces of gold. The beauty (ahem) of a fiat currency is that prices could remain steady (or slightly lower) in fiat terms, while crashing big-time in gold and wage terms. This is what I expect to happen — they will prevent fiat-denominated deflation, while the deflation bites in gold-denominated terms. The situation in Australia is much worse. Back in 1998 I had the opportunity to either buy a flat, using my deposit and a loan, or go on an overseas trip. With a lack of foresight, I chose the trip to London, as I thought house prices were a bit high compared to the previous few years. I thought it would give me some world experience before embarking on the mortgage treadmill. and return when prices reflected economics. Bad choice. Australian property prices have exploded since I studied at University. A raft of laws have changed. Reduction of capital gains by 50%, Negative Gearing (Taxes are reduced for interest cost incurred on borrowing money), limited supply, oversized housing lots and homes, increased immigration of wealthy buyers who pay cash, Foreign ownership (Now banned), full recourse loans all add up to sky high prices. I recall my first wage after graduation ($28,000) and a flat price of $100,000 (The one I first rented). The graduate wage is basically 40-45000 now, and the same flat is over $500000. Boy did I make a mistake travelling! The point is I have written to our Members of Parliament. Nothing is done. They pander to the middle class. I agree with Alex above, that a reduction in the equity of the ageing baby boomer middle class will be disasterous for consumer spending. The problem is many of the young are delaying marriage and child birth, because it is impossible to have a happy family in this day and age of uncertainty and mortgage stress. The birth rate is going to plunge in the next few years. It is unfair that baby boomers have 5 investment properties and the younger generation pays rent to them to have a fmaily. Something has to give. The Western countries are going to die out very soon!! Also, the current very low interest rates cannot last forever. As the cost of servicing a mortgage increases, the market value of property will reduce. Like I expected the Gold price has come back hard. Look at the nominal price of gold, and there is clearly a pop in the gold bubble. Gold is like any other commodity, and the restrictions in commodity trading since 2001, has pushed up Gold prices like every other commodity. When vending machines dispense gold, that is a sure sign that positions are being offloaded to the masses. Latest economic data on housing. A good blog for following the housing market. Intersting article explaining government intervention in the housing market.